I guess you’ll agree with me when I say that leftovers are every kitchen’s biggest headache, am I right? And if you have a small place, then most likely you don’t have a backyard where you can just dump it. This is why a garbage disposal unit is heaven sent to every household. 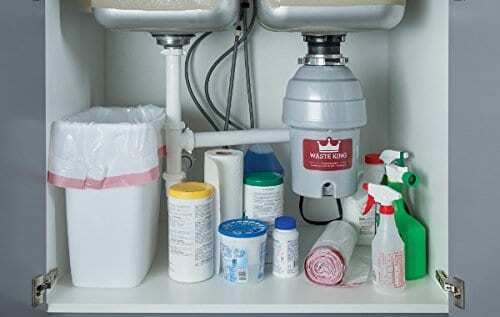 We all know how waste can quickly clog the drains and washbasins around the house. Fortunately, garbage disposal units are here to save the day and help you save the extra money you would otherwise spend on plumbers, over time. But if you’re afraid that you are a bit short on space and the area under your sink is barely big enough to store anything much more than a standard sized garbage disposal, well don’t worry! There will be a disposal unit that will suit your needs no matter how small your kitchen is. 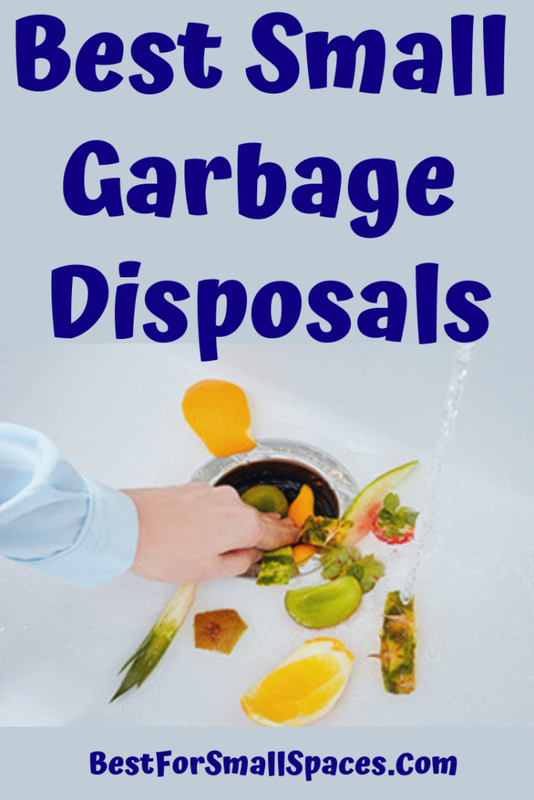 To help you with your decision, I have listed down below five of the Best Small Garbage Disposals 2019 available in the market today. So what are you waiting for, please keep on reading below! If you are looking for a high-powered garbage disposal unit but do not have the space for bigger models, then you need to consider InSinkErator Evolution Excel. This 1.0 hp Household Garbage Disposal can churn through every kind of food waste, be it soft or stubborn waste, without any difficulty at all. It can munch on everything and anything you will throw at it, from chicken bones, bruised apples and pears, potato peels and the list could go on. Well, thanks to its 3-Step Grinding Process: The GrindShear Ring, Tri-Action Lug system and Undercutter Disk. Once your food waste gets through these three stages, it will absolutely be beaten flat like the way you want it. The thing about a small home is that a single noise can wake up everyone and if you have a baby sleeping in the next room then that’s absolutely going to be a big problem. So I was incredibly impressed with how this product works so silently. You will hear almost nothing from the unit while it’s working its magic. This model features SoundSeal Plus technology and its manufacturer claims that it has 60% more sound resistance compared to a standard garbage disposal. Layers of insulation have been added so the noise and vibration will be isolated from all parts of the unit. It features auto-reverse technology which ensures that the disposer will not get jammed no matter how much food you toss on it. 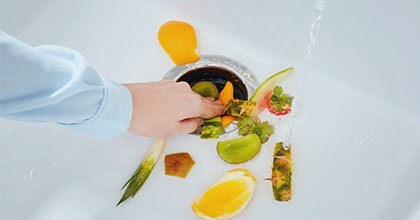 It will also change the direction of the rotation and make sure that all the food particles will get down the drain. Installation is also effortless. You will just need to spare 10 minutes of your day and your garbage disposal will be ready. The product comes with a manual that has very easy-to-follow instructions for installation. The grind chamber and grind components are made of stainless steel so we can be sure it’s durable and will have a longer lifespan. You don’t have to worry that its grinding performance will go downhill through time because of rusty parts or that you will have to replace the unit anytime soon. It has a large volume capacity at 40 oz. This means you can grind more waste food at a time. It’s very easy to clean since it comes with quality collar and wide mouth. You can just use cleaning brushes to scrub off any stains and remains. 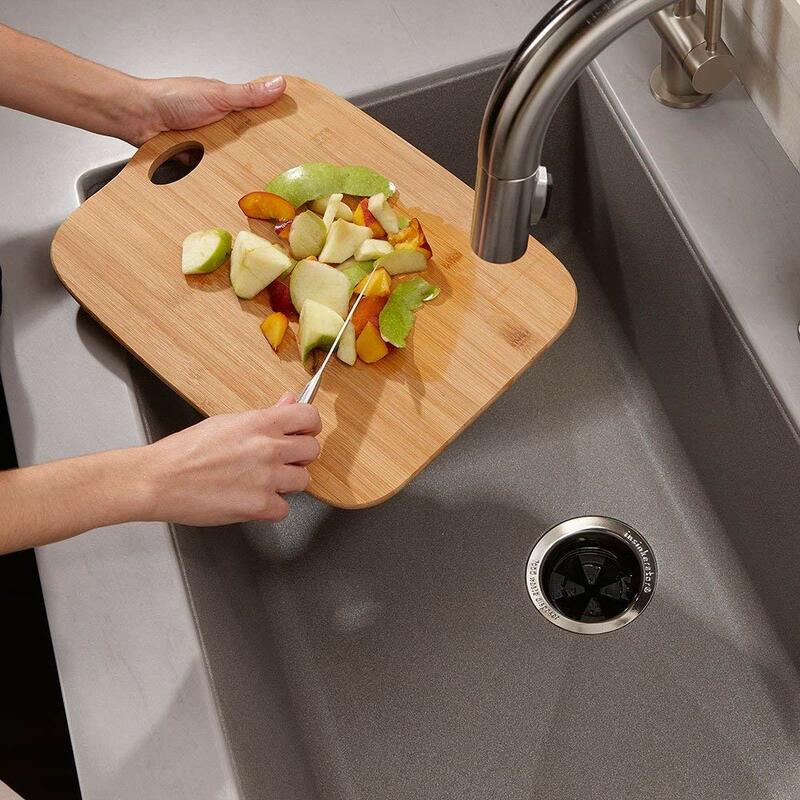 So if you’re a big family, but with a smaller sink cabinet, InSinkErator Evolution Excel will be able to neatly collect all your kitchen scraps and at the end of the day, you will have a kitchen that is as shiny as ever. This brand is not called Waste King for no reason. The L-8000 model is a perfect solution for small kitchens with limited cabinet space but despite its small footprint, it doesn’t compromise speed or power. With a 1 HP Permanent Magnet Motor and blades that run at 2,800 rotations per minute, there’s definitely more power in every pound. It can grind almost any food you’ll toss in it; not only the big, hard food waste like chicken drumsticks but also those uncomfortable vegetables and fruit peels that most disposers find difficult to grind. And since this is continuous feed disposal, you can endlessly place the food waste in while the grinder is still operating. This means the grinding operation will be very fast, saving your time while you are doing the dishes. This garbage disposal does not produce much noise thanks to the sound insulating material wrapped all over the unit. The grinding parts, which often are the noisiest parts, have been insulated while the grinding chamber is made from glass-filled nylon that can keep the noise down when it is pulverizing waste. Even the bearings and integrated parts have been lubricated just to bring the noise-level further down. The installation process is also not that bad. It will take you around 30 minutes to successfully install this garbage disposal unit. It comes with straightforward instructions that are really easy to follow. It has a Splash Guard feature that prevents valuables and important items from getting flushed down the drain. The Splash Guard is also removable and makes cleaning a piece of cake. It is composed of stainless steel parts that make sure it will not corrode or rust through time. With the power and speed of the Waste King L-8000 Garbage Disposal, it can absolutely be a blessing to your family, especially if yours is a big one that consumes several types of kitchen waste; this unit will be grinding like a monster and gets rid of your food waste within just minutes. The compact size of InSinkErator Evolution ¾ HP is absolutely perfect for anyone who has household space limitation, especially under the kitchen sink. Its dimension is lower than similar powerful units available in today’s market, but still, it is packed with powerful facilities and features. Plus, its overall look is sleek and classy. It comes with a ¾ HP Dura-Drive induction motor which is one of the most powerful motors today. It can run at a speed of 1725 rpm which is strong enough to handle food waste produced by a family with four members and that includes the tough ones like bones and fibrous foods. It works through its two-stage multi-grind mechanism: GrindShear Ring System and Tri-Action Lug System; both ensuring better grinding of garbage through its 34.6 oz grind chamber capacity and prevents any possible clogging. Just like other InSinkErator garbage disposal units, it adopts the patented SoundSeal Technology where the motor has been insulated while the sink mount and Tailpipe along with the sink baffle has anti-vibration features. It also has an Auto-Reverse Grind System that significantly reduces the possibility of jamming to occur. If the unit notices that there’s jamming somewhere inside, it will automatically spin in reverse and unclog. The grinding components are made from stainless steel, so corrosion and rust that can cause any internal breakage are less likely to happen. 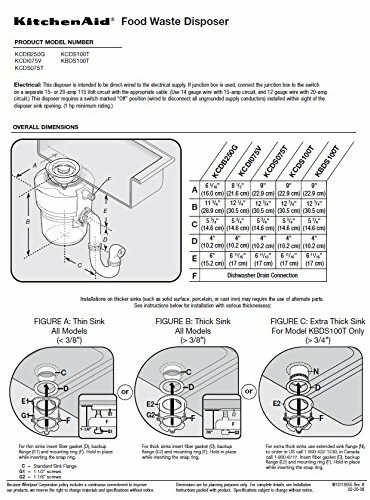 InSinkErator provided organized and very clear instructions on how to install this unit. As long as you follow the step by step installation manual, you will be done in a breeze. 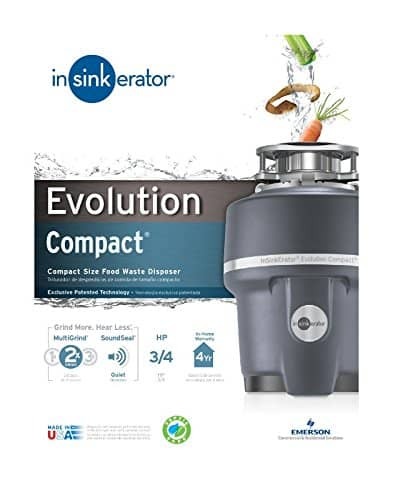 Overall, this small, sleek and powerful InSinkErator Evolution ¾ HP is a pretty good kitchen disposer for anyone who is looking for compact garbage disposal. ½ HP garbage disposal models are not only strong enough but also the ideal choice for small homes. The Kitchen Aid KCDB250G is your best bet and is packed with the best qualities most homeowners look for in a garbage disposal: efficient grinding, power, durability and even an attractive design. The powerful ½ HP motor of this unit can deliver an ideal speed of 1,275 rotations per minute, this means it is powerful enough to pulverize whatever food scrapes you will feed the unit and will continuously do so without any hiccups since it has a continuous feed type. The bonus is that, unlike most disposals that come in the usual black, grey or other boring colors, it has an attractive red design. It is almost effortless to install. Everything is easy to put in, whether you are installing it as a new unit or just replacing an old disposal. You can connect the unit into an electrical switch to ensure safety. It also has overload protection that automatically turns off the disposal once it notices something is wrong. There’s also a manual reset that is very important for any emergency situation. The disposal tank is made of stainless steel which is corrosion-free material and can resist chemicals that can likely cause defects to the machine. Overall, the Kitchen Aid KCDB250G is good enough for such a small unit. It will not only fit your small home but will also fit into your budget. Plus, it comes from a brand that has been widely known for its value and quality. Can you believe that KitchenAid has been in the business since the year 1919? Well, no wonder why Kitchen Aid KCDB250G is jam-packed with all these good features. Most small homes definitely have simple needs. And for a simple unit to get rid of your simple food waste, the InSinkErator Badger 1 is a perfect choice. It has 1/3 HP Dura-Drive induction motor and uses a one-stage grind technology which is a Grindshear ring. Though this means it will not take hard waste very well but it is suitable for grinding soft foods that just need a little more grinding. But what I liked about this product is how cost-effective it is. Unlike a lot of other models in today’s market, this unit utilizes less than 1% of average daily water consumption in most households. It also features SoundSeal technology that reduces the noise level, making this unit work very quietly. Installing it is a breeze; you won’t need an expert to do the job. You can easily mount the product and it does not need a power cord. It also uses Quick Lock technology that allows you to replace any InSinkErator disposal within just a few minutes. All of the grinding chamber’s components were made from stainless steel to make sure it will be durable and will last longer. Also, in addition to being limited-kitchen-space-friendly, the InSinkErator Badger 1 Garbage Disposal is also budget friendly. There’s no need to burn a hole in your pocket when you’re on a budget and still want to be able to dispose organic waste without a mess. When you’re choosing garbage disposal, there are a few things to consider. First of all, you need to make sure that your garbage disposal unit is small enough to comfortably fit under your sink. Then you need to choose the level of horsepower you want for your garbage disposal. But you have to remember that the size of your disposal is directly proportional to its power. So what can you expect from your small garbage disposal? ⅓ to ½ HP. These models are just perfect for small spaces like small homes, studio units or apartments with one to three family members. Though they are the weakest ones in the market, they are still quite popular because they are more affordable. ¾ HP. These are more suitable for families with four to six family members. They are stronger and often come with technologies that can deal with several types of food waste that most of the weaker units can’t handle, like bones and several hard vegetables. 1 HP. They are really strong and can grind almost anything, whether chicken bones, coffee grounds, fruit rinds and so much more, without the risk of jamming. They also often have more room for more food waste so that it can take care of a home with seven to nine people. There are also two basic feed types you can choose from: batch feed and continuous feed. Batch feed, as its name suggests, is a type of garbage disposal that lets you grind up your waste by batch. Though it will take a longer period of time to get rid of a large amount of waste, it is much safer since it requires you to fit a stopper lid in the disposal’s mouth before it will power on. This reduces the risk of jams caused by dropping something into the disposal that should not be in there. Continuous feed, on the other hand, will keep on grinding the moment you will switch the power on. So if you have a large amount of waste that needs grinding up, the continuous feed will definitely be the best option. 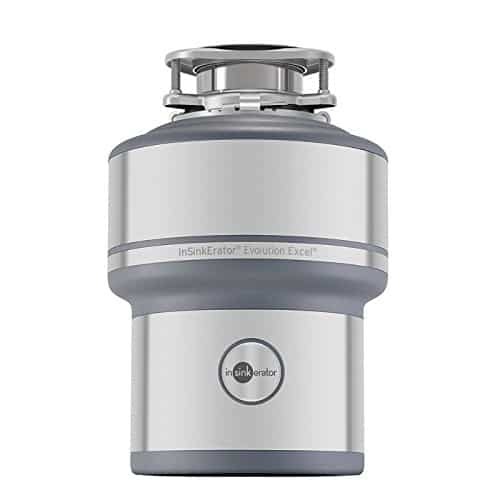 Garbage disposal with continuous feed are often also much cheaper compared to batch feed models and are generally more commonly available since they sell better. There are still a lot of minor features you need to consider. For instance, if you currently own a dishwasher, you might want to choose garbage disposal that comes with a dishwasher attachment. This will allow you to attach your disposal to the dishwasher through a tube so food from your compact dishwasher will be flushed into the disposal and be grounded up. You might also want to choose a garbage disposal unit that comes with stainless steel blades. Stainless steel material will not only be hard and sharp enough to grind up your food more finely but they also tend to last longer compared with other materials since stainless steel resists corrosion. Also, if noise is a key factor in your small home, then look around for garbage disposals with soundproofing layers or noise-reduction features. So there you have it, five of the Best Small Garbage Disposals 2019 that will make any kitchen with limited space easy to work in and clean up. I hope this article will help you find the perfect disposal unit for your kitchen. What are you waiting for? Go grab the garbage disposal that suits you best and reap the benefits it comes with.